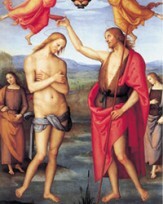 Pietro Vannucci best known as "Perugino", is considered as one of the most important character in the renascence age and the most representative painter in Umbria of the XVth century. We can see in him, as well as in the other umbrian painters a religious intimacy which comes directly from the spirituality of the region. The pleasant landscape of the Trasimeno lake or Foligno’s valley, with woods and castles, often on the background of his paintings. Perugino has often been mentioned with Leonardo da Vinci because of their intellecual and artistic affinity and with Sandro Botticelli, they also collaborated in the Sistin Chapel decorations. He lived between the end of the XVth century and the beginning of the XVI. He was born in 1450 AD in Città della Pieve, but soon he moves to Tuscany, first in Lucca, then in Florence where he attends the lessons of Verrocchio. Florence has a most important role on his education, so that his contemporaries consider him a master of florentine adoption. Among the distinctive marks of Perugino’s art, there are the consciousness of the landscape and the conquering of an atmospheric due to the frequentation with his study mate Leonardo. His first documented pieces of art are dated 1478, the year in which he paints some frescoes in the chucrh of Cerqueto, near Perugia, and The adoration of the Magi, which can be found in the Umbria National Gallery in Perugia. He achieves his artistic maturity with the Sistin Chapel decorations, working with all the most famous artists of the earliest renascence age, like Cosimo Rosselli, botticelli and the Ghirlandaio. Here he paints his masterpiece Christ giving the keys to Saint Peter. Balanced, harmonic figures move in a huge space limited by architectonic structure, derived from the experiences of Piero della Francesca, In the last part of his life, he mostly works in Umbria. It is a period extremely fertile for our artist. He paints masterpieces like The Marriage of the Virgin, that will be reiterpreteted by his pupil, the young Raphael, The Ascension, The Assumption, and The Triumph of Liberty. He ends his days in Perugia, in 1524.